Elisabeth Katrine Arctander and Christian Ludvig Arctander, Grave #1 "In memory of Elisabeth Katrine Arctander and Christian Ludvig Arctander"
H. N. Arctander, Grave #2 (October 19, 1834 to July 25, 1900) "KGL. Bogholder paa St. Thomas, RD af DBG *19 Octbr. 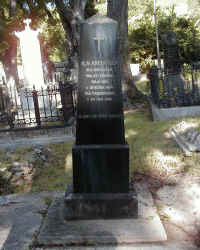 1834 paa Fredensborg +25 juli 1900, Elsket pg dybt savnet"
Christen Simonsen, Grave #3B (December 23, 1816 to May 26, 1901) "*Danmark 23 Dec. 1816 +St. 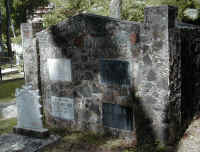 Thomas 26 Mai 1901 Elsket og savnet"
Wilhelm Ludvig Birch, Grave #7 (Born August 25, 1817 to February 26, 1874) "Wilhelm Ludvig Birch, Født den 25de August 1817, Goveneur for de dansk vestindiske colonier fra den 24de mai 1864 til sin død den 26de februar 1874. Han var sin konges fuldtroe mand, nidkjær for at fremme disse øers bedste ædel og kjærlig al sind, reen og uplettet i sin vandel, jevn og bramfri i af sin færd, hjalp hvor han kunde med raad og daad, lindrede mange trængendes nød." 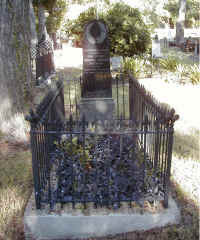 Carl Anthon Friedrich Christian Hattensen, Grave #8 (October 20, 1828 to October 30, 1884) "Gouvernementssegretair justitsraad Carl Anthon Friedrich Christian Hattensen Rd. af DBG. *Augustenborg 20 October 1828 +St. 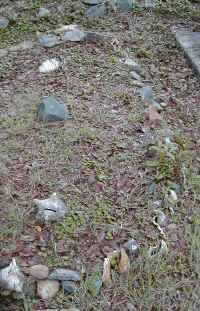 Thomas 30 August 1884"
Beatrice Gertrude, Grave #9 (October 15, 1851 to October 13, 1894) "In Loving Memory of Beatrice Gertrude, wife of Lionel Hampton Miller Born 15th October 1851, Died 13th October 1894. Thou will keep him in perfect peace whose mind is stayed on thee because he trusteth in thee. Isaiah XXVI.3"
Christian Frederik Paludan, Grave #10 (February 18, 1859 to November 5, 1896) "Christian Frederik Pauldan Captain og compagnichef. Født den 18de februar 1859, Død den 5te november 1896." Commandant of Militia on St. Thomas during the Mexican Silver Riot, 1892. Hother Hänschell, Grave #11 (September 15, 1846 to January 5, 1893) "Hother Hänschell, Gouvernernments secretair, F. 15 sept. 1846, D. 5 jan. 1893. Om du bekjender den herre Jesus med din mund og troer, at Gud oprejste ham fra de døde, skal du blive salig. Rom. 10. 9." Holger Julius Dons, Grave #13 (July 3, 1890 to June 21, 1907) "Kammerjunker Premierlieutenant Holger Julius Dons *3 juli 1870 Daurup, Sjælland +21 juni 1907, St. Thomas, Fred Kammerater i Danmark satte ham dette minde"
Captain Erik Johan Krabbe, Grave #14A (December 21, 1862 to July 20, 1897) "Captain Erik Johahn Krabbe *21 decbr 1862 +20 juli 1897"
Ellen Krabbe, Grave #14B (September 15, 1896 to August 6, 1897) "Ellen Krabbe *15 septbr. 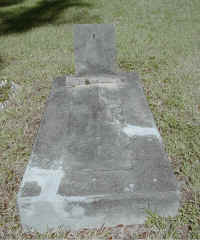 1896 +6 August 1897"
Laura Malvina Hansen, Grave #16 (November 4, 1876 to March 23, 1912) "Laura Malvina Hansen F. Tranberg *St. Croix 4, Nov 1876 +St.Thomas 23 Mar 1912. Hans, Otto, Ebba Torben Hvil i fred"
Hans Henrik Berg, Governor 1848, and 1853 - 1862. H. H. Berg, Grave #17A (November 25, 1788 to April 16, 1862) "Født 25 Nov 1788, Død 16 Apr 1862"
Catherine Berg, Grave #17B (June 4, 1792 to March 13, 1834) "Født Sheen. Født 4. Juni 1792. Død 13. Marts 1834." Niels Walter Berg, Grave #17C (June 18, 1826 to June 28, 1849) "Født 18 juni 1826, Død 28 juni 1849"
Mary Ann Cummings, Grave #20 (November 16, 1845 to November 9, 1899) "Født 16. November 1845. Død 9. November 1899"
Simon Jørgen Bie, Grave #21 (July 18, 1809 to January 27, 1900) "Kammerherre Simon Jørgen Bie, R. af DBG. M.D. Født d. 18 juli 1809, Død d. 27 januar 1900"
N. C. Gjellerup, Grave #22 (October 27, 1831 to August 7, 1904) "Kammeraad toldfuldmægtig N. C. Gjellerup *27 Oktbr. 1831, +7 Aug. 1904." A. 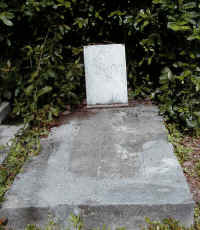 B. Todman, Grave #23 "A. 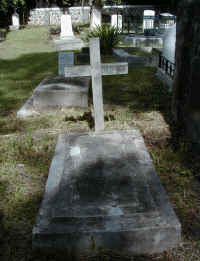 B. Todman E. VI AD. 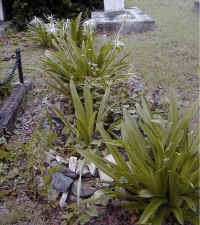 1853"
Franz Flint, Grave #26 (November 21, 1884 to July 7, 1915) "Hier ruht Franz Flint aus Hamburg Geboren am 21. Nov. 1884, Gestorben am 7. July 1915. Ruhe sanft in fremder Erde." Christian Ludvig Schellerup, Grave #28 (November 29, 1849 to May 10, 1898) "Christian Ludvig Schellerup, Landfoged paa St. Jan. *29 November 1849, +10 Maj 1898. 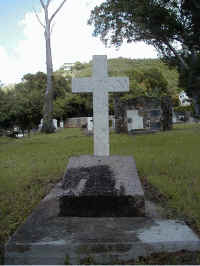 Velsignet være dit minde" Son of Building Inspector on St. Croix, Christian Ludvig Schellerup, Sr. Chief Postal Clerk, St. Thomas, Police Assistant, St. Thomas; Administrator & Judge, St. Jan. Married at Christiansted 1877, Amna Eliza Samueljer. Five children. 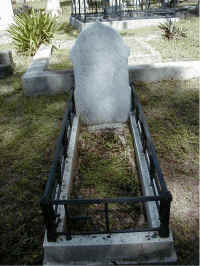 Carlina F. Christensen, Grave #30A (February 20, 1856 to April 26, 1920) "In Loving Memory of Carlina F. Christensen, Born Feb. 20. 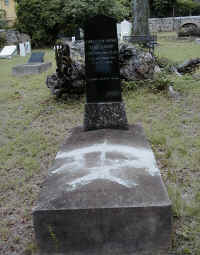 1856, Died Apr. 26, 1920. R.I.P." 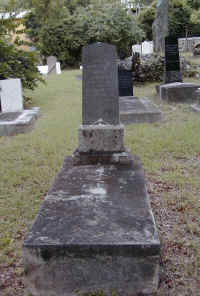 Hans Christensen, Grave #30B (September 15, 1840 to February 20, 1911) "In Loving Memory of Hans Christensen, born September 15th. 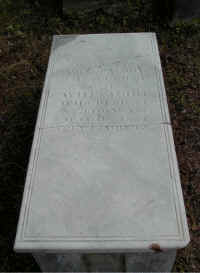 1840. died February 20th. 1911. R.I.P." 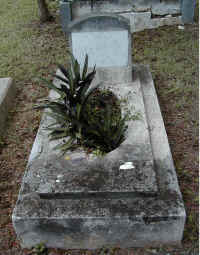 Edna H. Christensen, Grave #30C (March 28, 1893 to November 21, 1971) "Beloved Mother Edna H. Christensen March 28, 1893 November 21, 1971. R.I.P." William C. Christensen, Grave #30D (October 7, 1920 to July 15, 1982) "In Loving Memory of William C. Christensen, Oct. 7, 1920 July 15, 1982. R.I.P." Ludvig C. Christensen, Grave #30E (September 18 1885 to October 15 1960) "Ludvig C. Christensen, Born September 18, 1885, Died October 15, 1960"
Viggo Anthon Christensen M.D., Grave #30F (October 1, 1875 to September 16, 1948) "Viggo Anthon Christensen M.D., Oct. 1, 1875 Sept. 16, 1948"
Martha Reynolds Ames, Grave #31 "Martha Reynolds Ames Died February 28th 1927"
Edward Vivian Petford, Grave #32 (September 2, 1899 to May 23, 1909) "In Loving Memory of Edward Vivian Petford, Born Sept. 2nd 1899, Died May 23rd 1909. "Of Such is the Kingdom of God."" 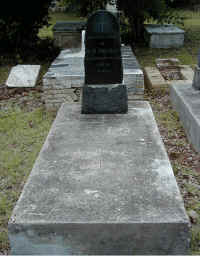 Alfred Ernest Hooper, Grave #33 (April 29, 1902 to January 20, 1903) ""In Loving Memory of Alfred Ernest Hooper, Born April 29. 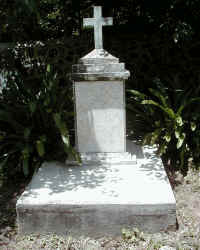 1902, Died January 20. 1903. "Thy Will be Done""
Anna Mathilde Albrechtsen, Grave #34A (March 31, 1876 to July 16, 1905) "Anna Mathilde Albrechtsen, F. Hansen, Født i Ebeltoft D. 31 marts 1876, Død paa St. Thomas D. 16 juli 1905"
Ingeborg Albrechtsen, Grave #34B (January 5, 1900 to August 7, 1900) "Ingebrog Albrechtsen Født d. 5 januar 1900, Død d, 7 August 1900"
Holger Jacobsen, Grave #35 (November 28, 1878 to May 30, 1909) "Købmand Holger Jacobsen, Født i Aarhus 28 Nov 1878, Død 30 Mai 1909. 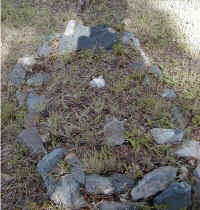 Elsket of savnet"
Elsa Becker, Grave #38A (May 24, 1874 to February 23, 1893) "Zu Andenken an Elsa Becker, Geb. 24 Mai 1874, Gest. 23 Febr 1893. Wenn Liebes uns verässt Es bleibt die hiebe." 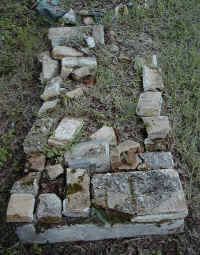 Julia Ann Whitmore, Grave #38B (Died May 11, 1835) "In the memory of Julia, Ann, Whitmore: daughter of J. C. & E. A. Whitmore, who died at St.Thomas, May 11th 1835. Aged 15 months." Christoph Robert Nolting, Grave #42 (March 12, 1827 to July 21, 1854) "Hier ruhet Christoph Robert Notling aus Lubeck, Geboren am 12 Marz 1827. 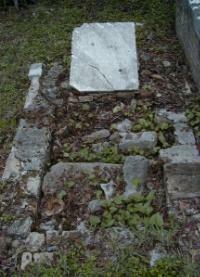 Gestorben am 21 July 1854." 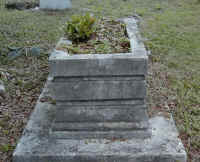 Emma Victoria Taylor, Grave #43 (October 8, 1848 to March 23, 1928) "In memory of Emma Victoria Taylor Born October 8, 1848 Died March 23, 1928 R.I.P." 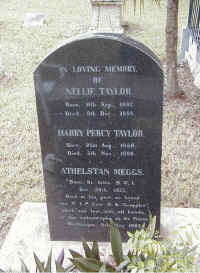 Nellie Taylor, Grave #44A (September 11, 1862 to December 8, 1884) "In loving memory of Nellie Taylor. Born, 11th Sep. 1867. 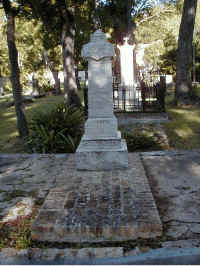 Died 8th Dec., 1884." Harry Percy Taylor, Grave #44B (August 21, 1880 to November 5, 1899) "Harry Percy Taylor Born, 21 Aug., 1880, Died 5 nov, 1899"
Athelstan Meggs, Grave #44C (October 28, 1877 to May 8, 1902) "Athelstan Meggs, Born, St. Kitts. B.W.I. Oct. 28, 1877. Died at his post on board the W.I.P. Co's S.S. "Grappler," which was lost, with all hands, in the catastrophe at St. Pierre, Martinique 8th May 1902." 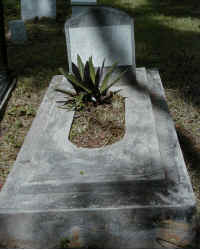 Graciella Martina Mena Taylor, Grave #44D (November 11, 1909 to August 26, 1994) "Taylor, Graciella Martina Mena, beloved wife of Bernardo, Nov. 11, 1909 Aug. 26, 1994. Bernardo Edwin Leroy Taylor, Grave #44E (July 23, 1912 to January 1, 1990) "Bernardo Edwin Leroy Grandson of Emma July 23, 1912 Jan.1, 1990"
Herbert Anthony Taylor, Grave #45 (January 22, 1879 to June 6, 1937) "In memory of Herbert Anthony Taylor Born January 22, 1879 Died June 6, 1937 R.I.P." 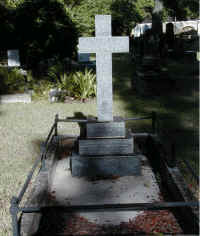 Johannes Geltzer, Grave #46 (March 2, 1869 to October 16, 1890) "Johannes Geltzer, Födt 2 marts 1869 i Ruds, Vedby, Död 15 October 1890 paa St. Thomas." Victorine I. F. Hahn, Grave #47 (September 25, 1866 to June 14, 1890) "Victorine I. F. Hahn Born 25th September 1866. 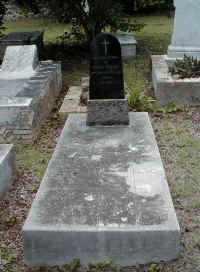 Died 14th June 1890." Rev. 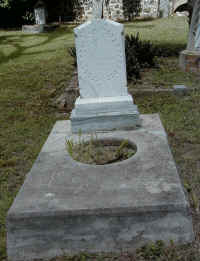 John C. Lowe, Grave #48 (Died July 29, 1890) "In memory of Rev. 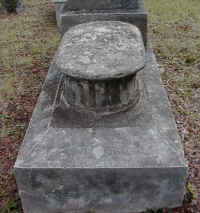 John C. Lowe of New Jersey, U.S.A. Died July 29th 1890 Aged 61 years. He died as he lived, a Christian. 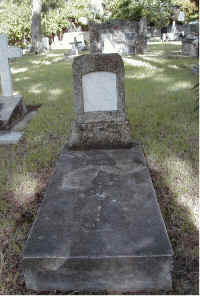 At Rest"
Joseph Ridgway, Grave #49 (Died June 30, 1908) "In loving memory of Joseph Ridgway who died June 30-1908 Aged 64 At Rest"
A. D. Ridgway, Grave #50 (Died February 5, 1920) "In loving memory of A. D. Ridgway died February 5th 1920 Aged 75 At Rest"
Thomas Pearson, Grave #51 (February 10, 1828 to August 12, 1896) "Sacred to the memory of Thomas Pearson, who was born at Ambleside, Westmoreland, England and died 12th August 1896, in his 68th year. "He which soweth bountifully shall reep also bountifully." "For God Loveth a cheerful giver." II. Cor. IX 6.7." Merchant of St.Thomas with father, George, and brother Timothy. 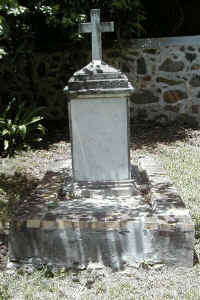 Born 10 February, 1828, Ambleside, Westmoreland, England he married on St. Thomas, Camilla Petersen. Two children: (1) Charles Pearson (1868-1949) who married Olga Anna Berg (1887-1964) daughter of Conrad Berg and his 1st wife, Emmeline Liggett. * (2) Bertha Pearson who married and lived in England. *Charles and Olga Pearson were the parents of three children: two sons and a daughter. 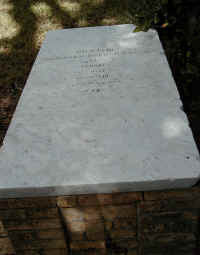 Their daughter, Bertha, married on St. Thomas, Hjalmer Bang, who was to become Director of the West India Company and Consul General of Denmark from 1936 - 1944. Their home, "Denmark Hill", was the scene of various functions, notably the visits of the Danish royal family to St. Thomas. 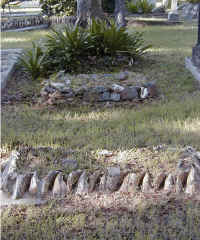 Nicholas Ann Jones, Grave #54 (Died January 5, 1866) "Sacred to the memory of Nicholas Ann, wife of Oswald Jones, Died 5th January 1866. Yea like as a father piteth his own children, even so is the Lord merciful unto them that fear him. 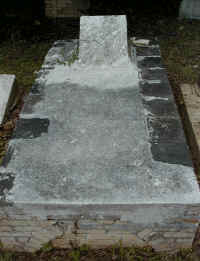 Edward Nelson, Grave #56 (August 13, 1862 to December 3, 1862) "Sacred to the memory of Edward Nelson, the beloved Son of Timothy Nelson, and Emily Annie Pearson. 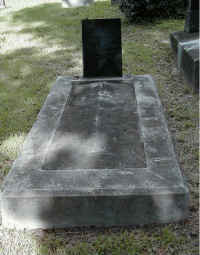 He was born in St. Thomas, on the 13th, of August; and died on the 3rd of December 1862. "Of such is kingdom the of heaven." 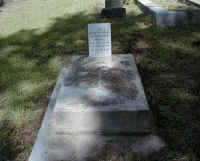 Edward Nelson (Pearson) The son of Timothy Nealson Pearson and his Emily Anne Dehurst, daughter of Ferdinand Augustus Dewhurst, Judge on St. Jan. 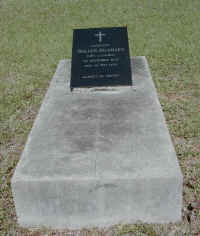 They had two other children: 20 William Dewhurst Pearson (b. 1863) And 3) Amy Isabel Pearson (b. 1865). 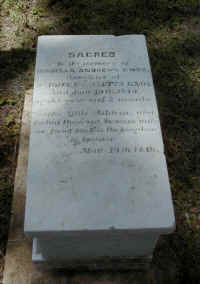 Annie Duncan Leckie, Grave #60A (March 10, 1838 to December 6, 1864) "Sacred to the memory of Annie Duncan. 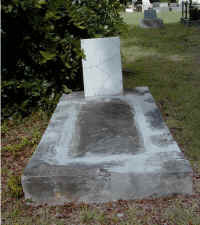 Wife of Henry Leckie. Born at Glasgow, Scotland. 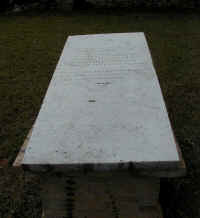 March 10, 1838, Died at St. Thomas, December 6th 1864" "I know that my Redeemer liveth." 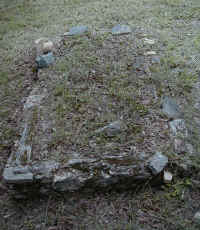 Annabella Douglas Torrance Allan, Grave #60B (March 2, 1821 to June 29, 1862) "Sacred to the Annabella Douglas Torrance, wife of the Revd W. O. Allan. Born at Kilmarnok, Scotland. March 2nd 1821. 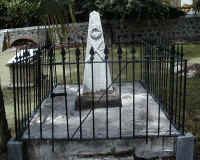 Died St. Thomas, June 29th 1862. She opened her mouth with wisdom and in her tongue was the law of kindness. Prov. XXXI. 26. Erected by a few of her young friends"
Conrad Christopher Moe, Grave #61A (November 1, 1787 to December 17, 1840) "Denne steen er reist som et kiæligt minde om Etatsraad, Notarius publicus og 1ste. medlem af St: Thomæ skifteret Conrad Christopher Moe, föd: 1ste. Novbr. 1787, död paa reisen til Europa d: 17de. Decbr, 1840, ombord i den engelske Paket Tyrian, Den kiæligste bedste mand og fader, Den utrætteligc samvittighedsfulder redelige Embedsmand, begrædes af hans dybtsörgende enke, börn, slægtninge, medbogere. 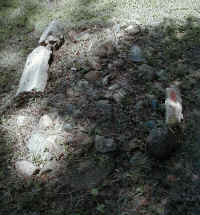 Louise, His Daughter, Grave #61B Hisset har han gein fundet sin elskede datter, Louise der döde 23 aar gammel d. 10de octbr. 1839, og hvis been nedlagdes i denne grav fred være med de döde. 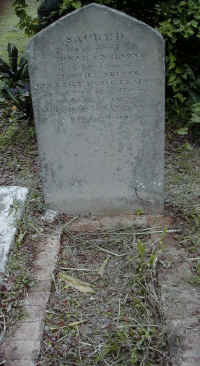 Edward Simmons, Grave #61C (August 18, 1849 to January 24, 1869) "In memory of Edward son of Edward and Eliza Simmons Born at St. Thomas 18 Aug. 1849; Died 24 Jan. 1869. "Blessed are the pure in heart for they shall see God."" 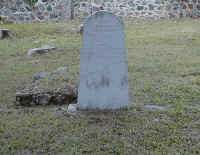 Cornelia Brett, Grave #62 (October 18, 1821 to September 24, 1843) "In memory of Cornelia Brett the wife of the reverend Philip Milledoller Brett, Pastor of the reformed Dutch Church of this Island and daughter of Cornelius Bogert Esquire, of New York. Born in the city of New York Octr. 18th. 1821. Died on Sunday Septr. 24th. 1843. Aged 21 years, 11 months, and 6 days. Precious in the sight of the Lord is the death of his saints. Ps. 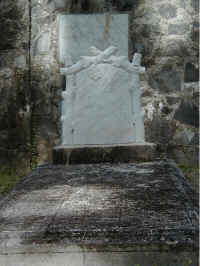 CXVI. 15." 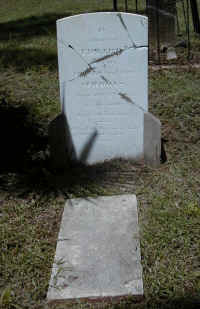 Isabella Andrews Knox, Grave #63 (Died June 19, 1849) "Sacred to the memory of Isabella Andrews Knox, daughter of Rev John P. & Aletta Knox died June 19th, 1849, aged 1 year and 2 months. "Suffer little children, and forbid them not, to come unto me: for of such is the kingdom of heaven." Matt. 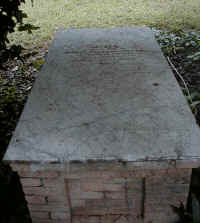 19th, 14th"
Caesar Amandus Heise, Grave #64B (March 21, 1831 to October 22, 1852) "Hier ruhet Caesar Amandus Heise, Geboren d. 21 marz 1831, Gestorben d. 22 oct. 1852"
Victor Chr. AD. 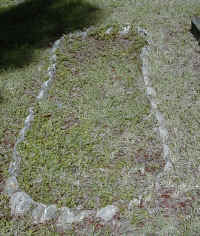 Schmidt, Grrave #64C (September 23, 1836 to June 26, 1853) "Hier ruhet Victor Chr. AD. Schmidt, Geboren in Cassel den 23sten September 1836, Gestorben d. 26sten juni 1853"
Friederich Carl Schmidt, Grave #64D (September 13, 1864 to April 8, 1865) "Hier ruhet Friederich Carl Schmidt, Geboren d. 13ten September 1864, Gestorben d. 8ten April, 1865"
Lucie Anna Sanoz, Grave #66 "1849 17 aout, Fut rappelee au seigneur Lucie Anna Sandoz, Agee de 22 ans. Laissant dans laffliction un fiancé qu elle aimait des parens quila cherissaient. Des amis qui la pleurent. Heureux ceux qui comme elle meurent au Seigneur ils se reposnt de leurs travaux el leurs oervres les suivent." 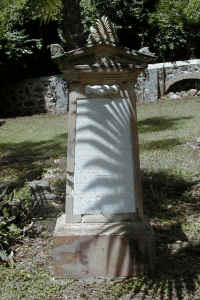 Herm Laue, Grave #67 (September 26, 1843 to January 31, 1871) "In memory of Herm Laue of Hamburgh, Born Septbr. 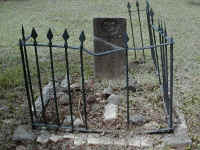 26th 1843, Died Jan. 31st 1871." 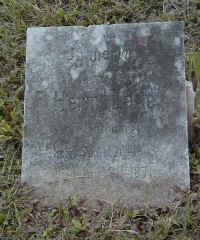 Jessie Mitchel, Grave #68 (Died May 12, 1852) "Jessie Mitchel infant daughter of Thomas & Julie M. Pott died May 12. 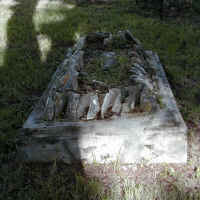 1852; aged 7 months and 25 days." 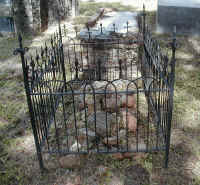 Hother T. L. Rasmussen, Grave #69 (November 3, 1854 to May 29, 1898) "Her under hviler kanoner Hother T. L. Rasmussen. *i Kjøbenhavn d.3 November 1854. +Ombord i skonnerten St. Thomas d. 29 mai 1898. Kammeraterne ombord satte ham dette minde." 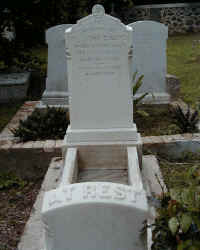 Paul P. S. Holst, Grave #70 (October 23, 1849 to June 20, 1898) "Her under hviler sejlmager Paul P. S. Holst. 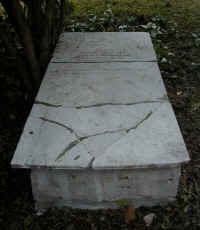 *i Kjøbenhavn d.23 October 1849, +Ombord i skonnerten St. Thomas d. 20 juni 1898. Kammeraterne ombord satte ham dette minde." 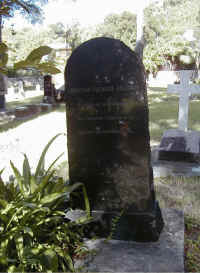 Hunter Morrison, Grave #71 (December 29, 1797 to March 9, 1863) "Sacred to the memory of Hunter Morrison Born in Englad 29th December 1797, Died at St. Thomas 9th March 1863. Mark the perfect man, and behold upright: for the end of that man is peace. Psalm XXXVII. 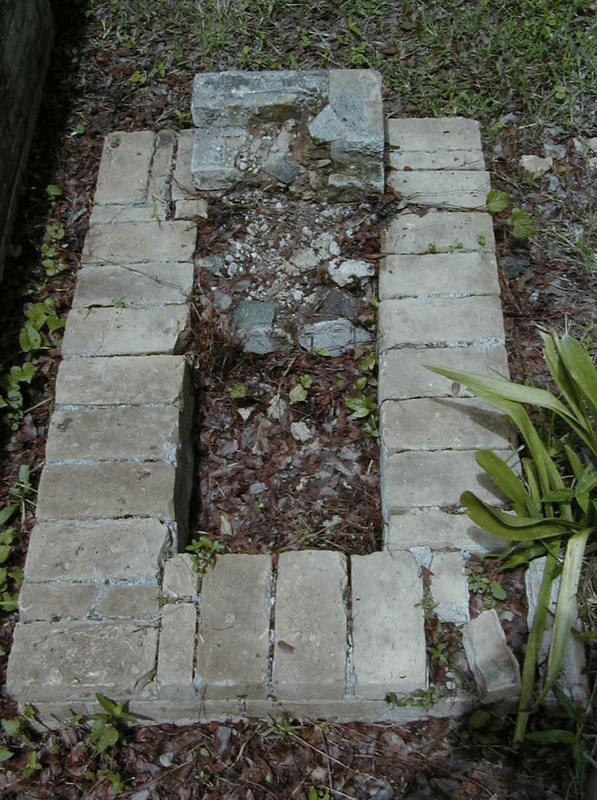 V.37"
Robert Gardener Milner, Grave #72 (Died March 31, 1859) "Sacred to the memory of Robert Gardner Milner who departed this life 31st. march 1859. in the 61st year of his age."